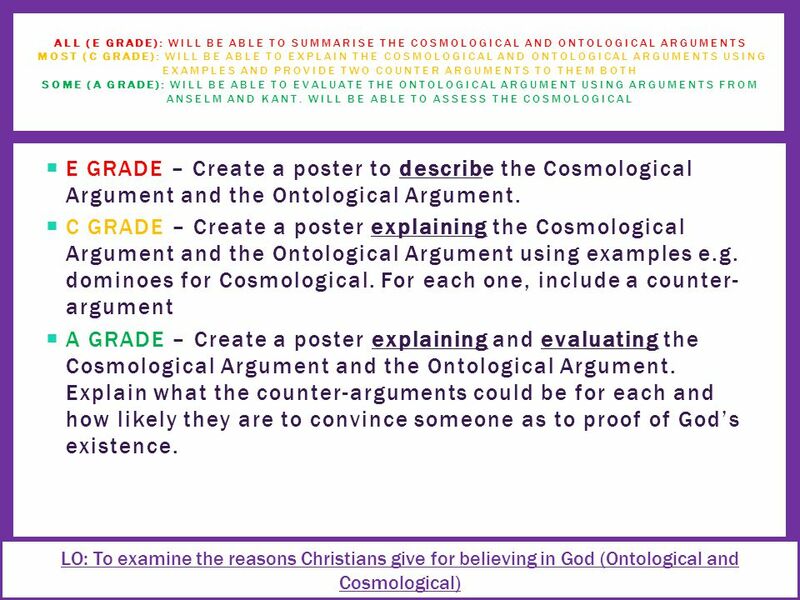 4 ONTOLOGICAL This is an argument based on logic & language. Who is the greatest? ‘God is that than which nothing greater can be conceived.’ God is the greatest, most perfect thing you can ever imagine. He must exist otherwise you couldn’t produce this description. If God is perfect in every way, He must exist in reality. If He existed only in the mind we could imagine a more perfect God – one that existed in the mind and in reality. Therefore, God exists! 5 COSMOLOGICAL What started everything? In other words what caused everything to exist in the first place? Only God could be the first cause, back to which every event can be traced (like the ‘domino effect’). St. Thomas Aquinas argued that something cannot come from nothing. Therefore the universe must have a cause – something or someone must have brought it into existence. Someone must have started the chain of events. How could a Christian use this argument, as well as the scientific evidence of the Big Bang, to explain the existence of God? 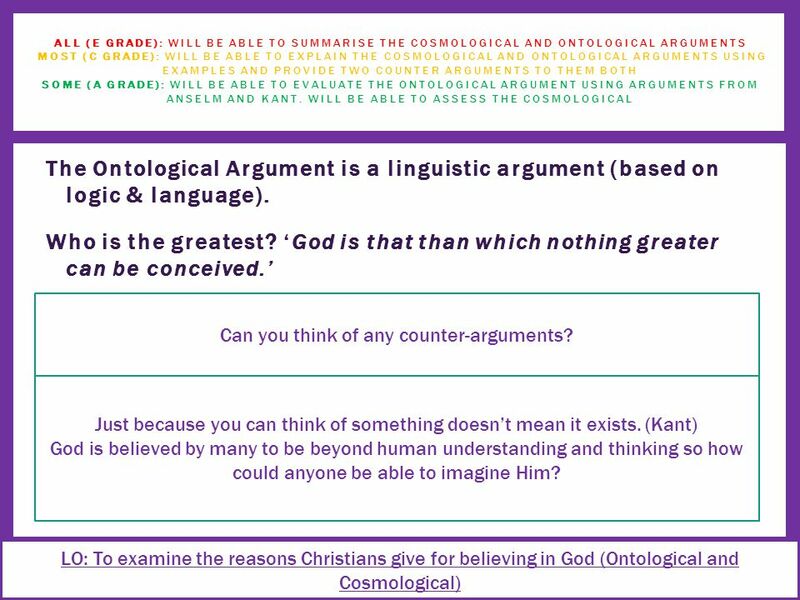 8 The Ontological Argument is a linguistic argument (based on logic & language). Who is the greatest? ‘God is that than which nothing greater can be conceived.’  God is the greatest, most perfect thing you can ever imagine.  He must exist otherwise you couldn’t produce this description.  If God is perfect in every way, He must exist in reality.  If He existed only in the mind we could imagine a more perfect God – one that existed in the mind and in reality. Therefore, God exists! 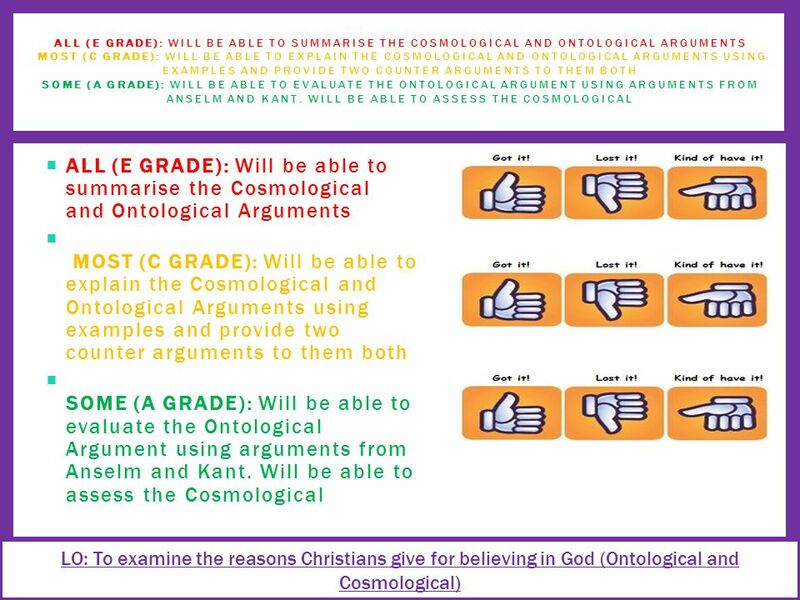 ALL (E GRADE): WILL BE ABLE TO SUMMARISE THE COSMOLOGICAL AND ONTOLOGICAL ARGUMENTS MOST (C GRADE): WILL BE ABLE TO EXPLAIN THE COSMOLOGICAL AND ONTOLOGICAL ARGUMENTS USING EXAMPLES AND PROVIDE TWO COUNTER ARGUMENTS TO THEM BOTH SOME (A GRADE): WILL BE ABLE TO EVALUATE THE ONTOLOGICAL ARGUMENT USING ARGUMENTS FROM ANSELM AND KANT. 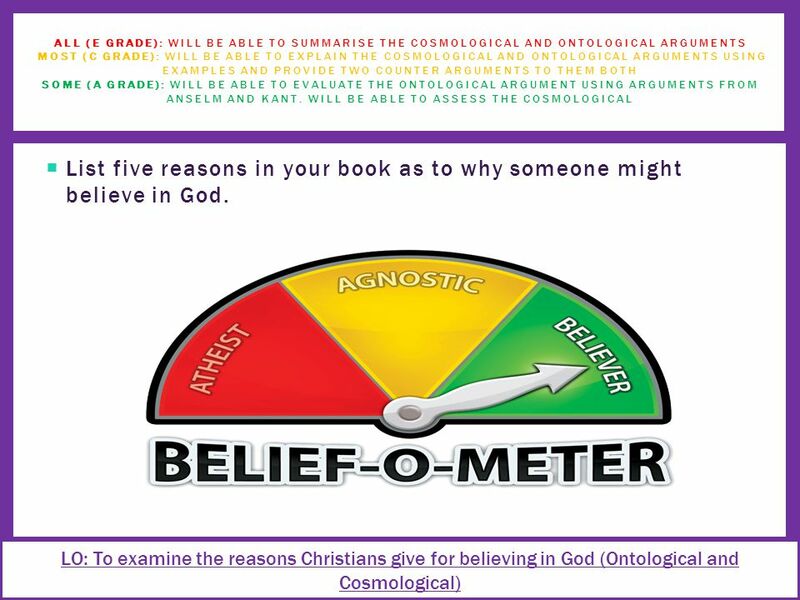 WILL BE ABLE TO ASSESS THE COSMOLOGICAL LO: To examine the reasons Christians give for believing in God (Ontological and Cosmological) Can you think of any counter-arguments? Just because you can think of something doesn’t mean it exists. (Kant) God is believed by many to be beyond human understanding and thinking so how could anyone be able to imagine Him? 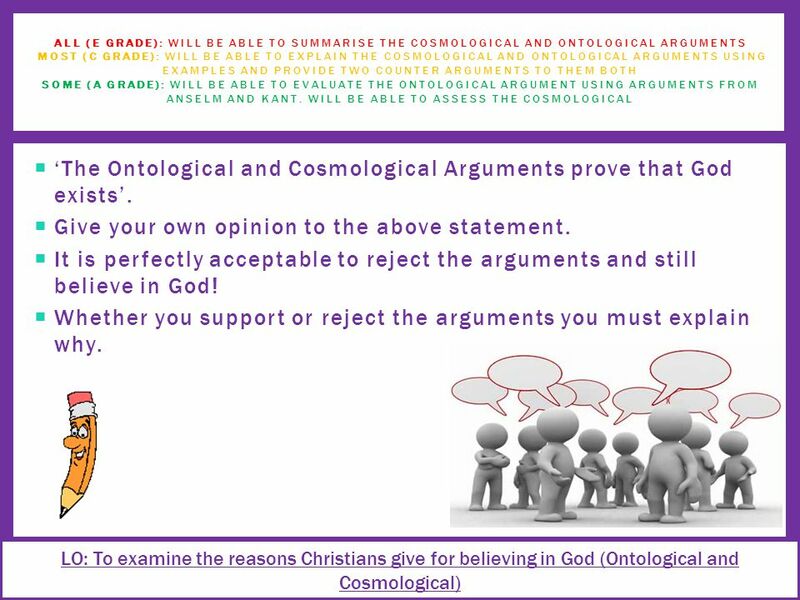 Download ppt "ALL (E GRADE): Will be able to summarise the Cosmological and Ontological Arguments MOST (C GRADE): Will be able to explain the Cosmological and Ontological." RE Revision Believing in God. 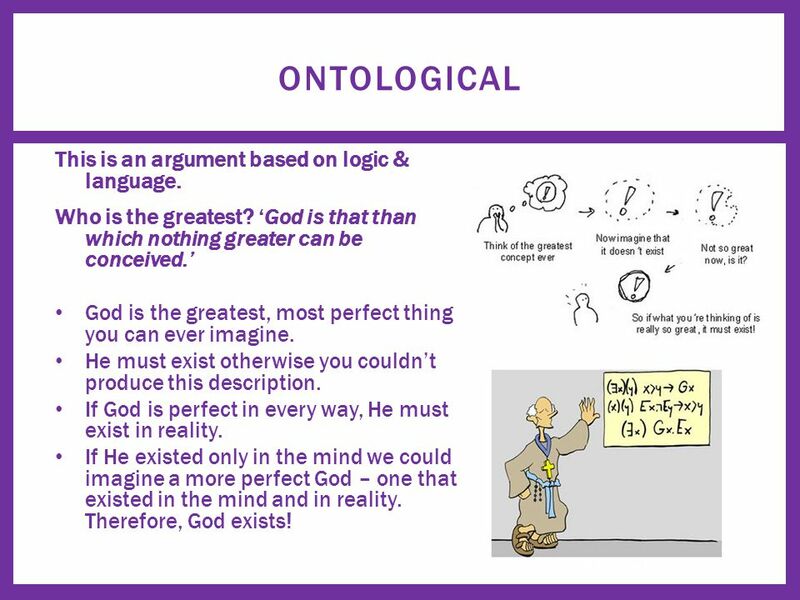 The ontological argument is based entirely upon logic and reason and doesn’t really try to give a posteriori evidence to back it up. Anselm would claim. 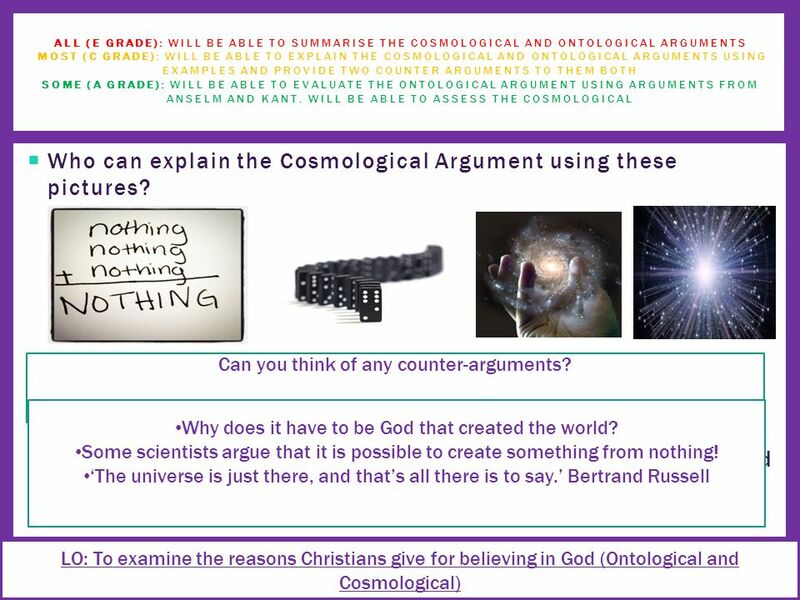 The Cosmological Argument for God’s Existence. Argument’s basic theme: Everything that exists must have a cause. The universe exists, therefore it must. The Ontological Argument. Anselm’s Argument So the fool has to agree that the concept of something than which nothing greater can be thought exists in. 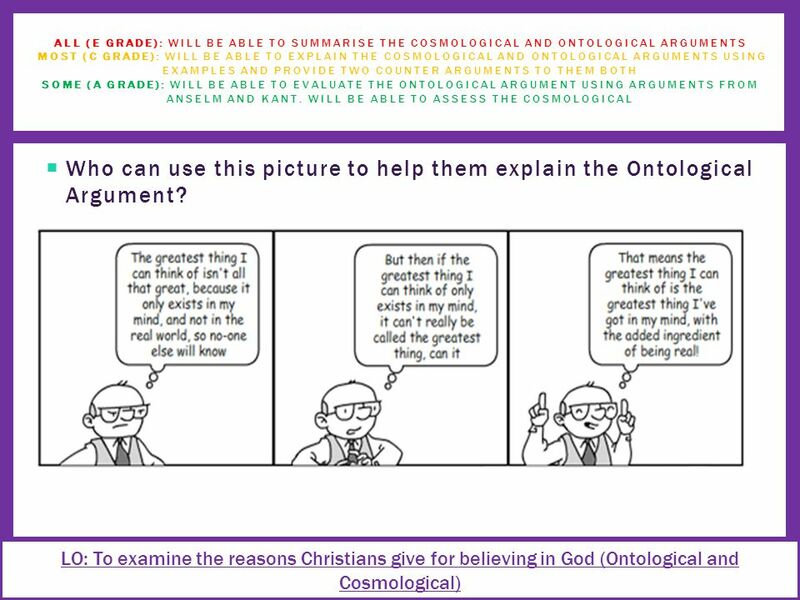 To study Thomas Aquinas’ argument from CAUSATION as an argument for the existence of God. (SAINT) Thomas Aquinas= a 13 th Century Catholic priest, theologian. 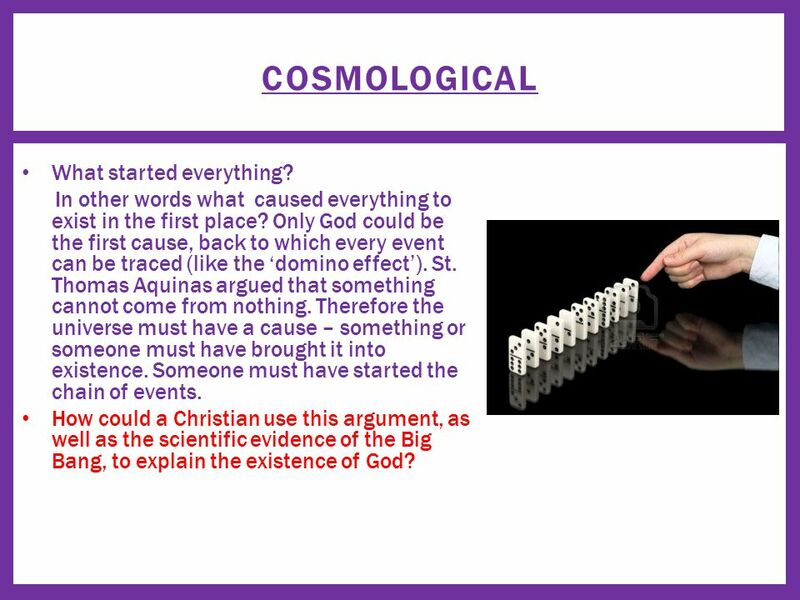 The Cosmological Argument St. Thomas Aquinas ( AD) Italian priest, philosopher. 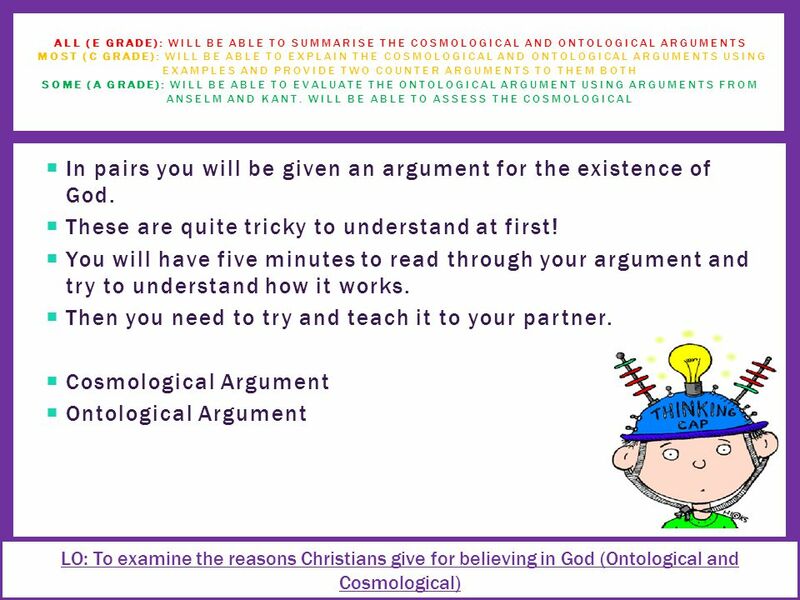 The Cosmological Argument The idea that there is a first cause behind the existence of the universe. 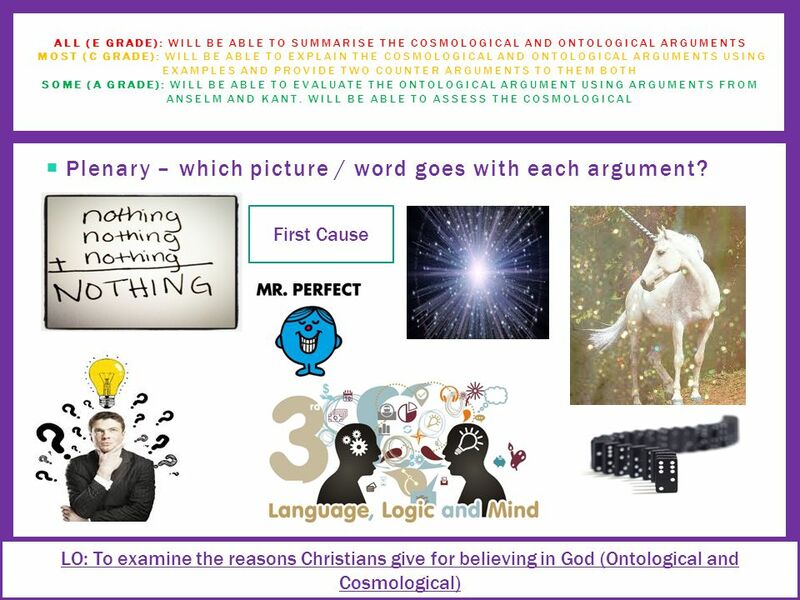 The Cosmological and Teleological Arguments ARGUMENTS FOR THE EXISTENCE OF GOD. Goals Define “God” by the Judeo-Christian definition Define omnipotence, omniscience, omni- benevolence, and omni-presence Be able to list and defend several. Is Belief in God Reasonable? 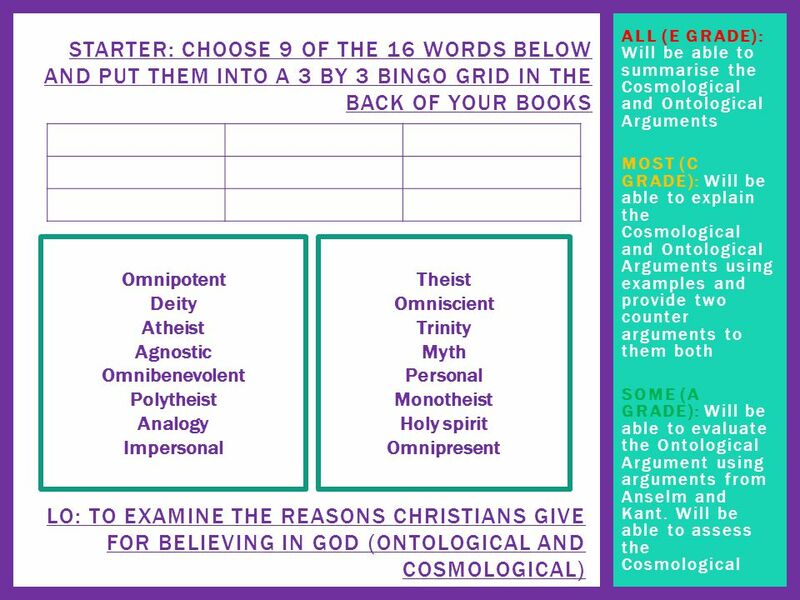 Faith Seeking Understanding A posteriori arguments (based on experience): The teleological argument (from design) The cosmological. Can we prove that God Exists? Philosophers through the centuries have tried to prove whether God exists. The Ontological Proof (II) We have seen that, if someone wishes to challenge the soundness of the Modal Ontological, he denies the truth of the second.